Calypso bulbosa bears a single flower on a single purple stem, with a length of 5 to 20 cm. Each plant has a single, dark green, oval leaf at the base of the plant. 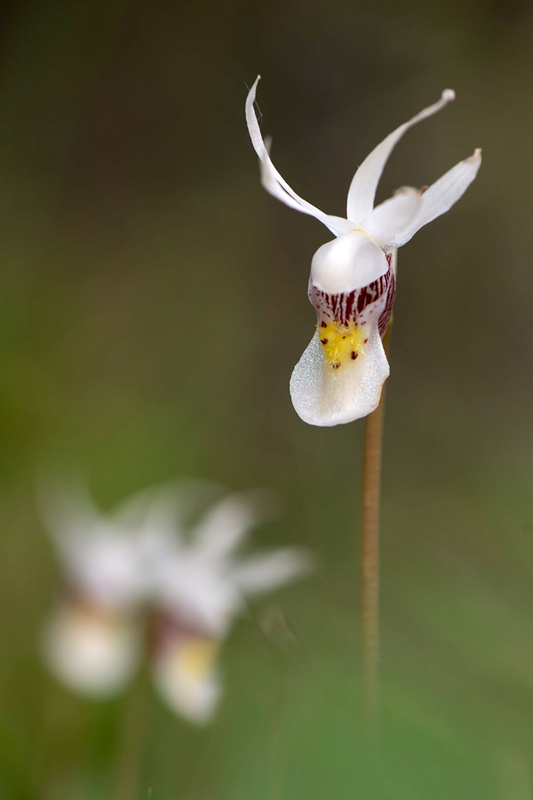 The petals and sepals of the flower are held above a large lip with the form of a slipper-shaped pouch. They are pollinated by bumblebees who get into this pouch. The flowers emit a vanilla-like aroma. Linné first described the plant as Cypripedium bulbosum, in his opus Species plantarum (1753). In 1806, the English botanist Richard Anthony Salisbury (1761-1829) gab it the valid name Calypso bulbosa. Flower colour ranges from rich purple, several shades of pink to white, the lip is white to purple, and the inside of the pouch is lined with purple to reddish veins. 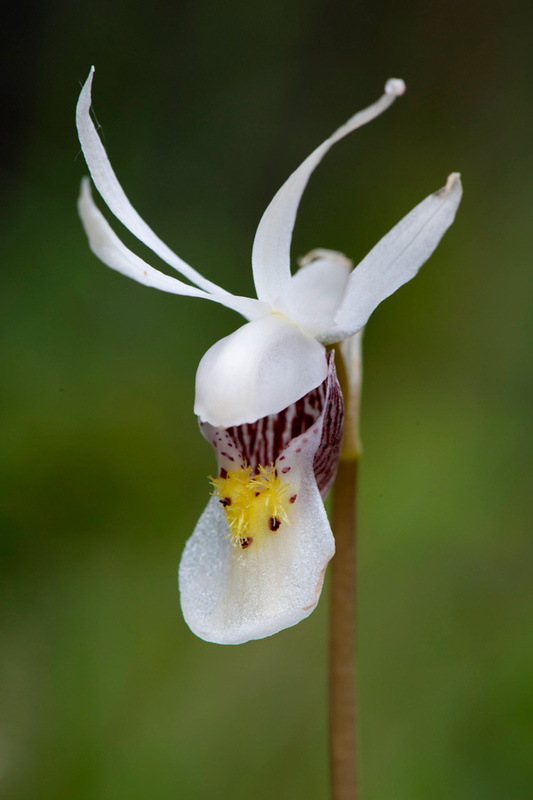 White forms are relatively common in Northern America and have been described by Paul Martin Brown (In: North American Native Orchid Journal, Vol.1, No.1, 1995) as Calypso bulbosa var.americana f. albiflora and as Calypso bulbosa var. occidentalis f. nivea. 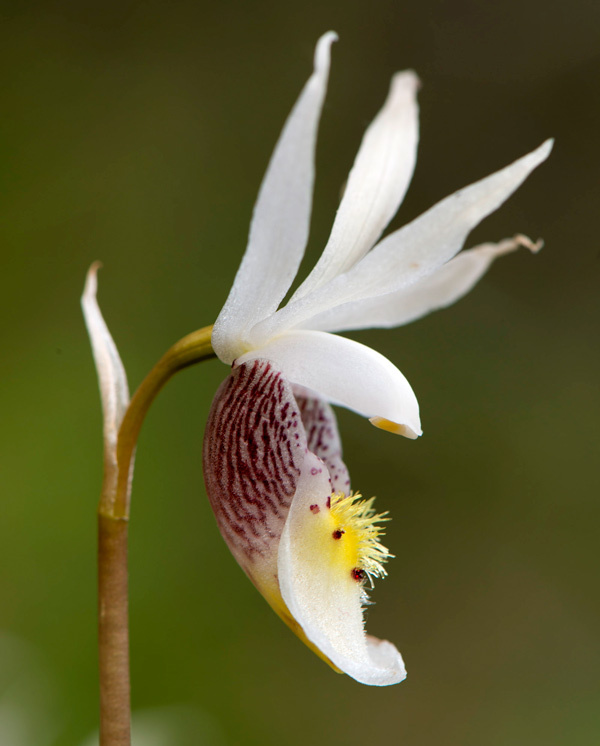 Calypso bulbosa has a circumpolar distribution, occurring in Europe, Asia and North America. In Europe is does not grow south of 57 ºN, and in North America is occurs from Alaska to Labrador, south to northern California, Arizona, Michigan and Maine. Bloom is from May to June.